Luxury penthouse with terrace in the center of Arrecife. Reformed! Spectacular penthouse located in the most central area of ​​Arrecife. It is close to the old town, the Charco de San Ginés and the shopping streets. The whole house has natural light. Enjoy the wonderful terrace. The house is designed to spend so much time inside, enjoying the careful decoration, as outside, enjoying the wonderful Sun we have in the Canary Islands. It was completed in February 2018. New! Both the living room and the two main bedrooms have access to the outside terrace. In the living room there is a 55-inch Samsung TV, with 4K resolution and SmartTV. There is a satellite decoder with open channels from different European countries (English, German, Belgian, French, ...). There are also Spanish DTT channels, some of which broadcast some content in English, selecting the language on television. Television is connected to the internet and has access to applications such as YouTube or NetFlix. There is free WiFi throughout the house. The kitchen is independent and is fully equipped. There is a fridge with freezer, ceramic induction hob with three burners, oven and microwave. Also, there are small appliances like toaster, kettle, coffee maker, etc. The kitchen has everything you need, including quality kitchenware and crockery. What do we provide? We do not want you to arrive with your suitcase loaded. That's why we always provide the basics: toilet paper, kitchen paper, water, beer, some fresh fruit, salt, pepper, tea, other spices, olive oil, cleaning products, detergent and fabric softener. In addition, you will have white bath towels, white hand towels, beach towels and clean bedding. Bed linen and a clean bathroom are provided weekly at no additional cost. Where do I park? There is parking available in the same building for those who come with a rental car. Actually, you do not need the car to get around Arrecife. because all the points of interest are less than 5 minutes walking. Arrecife has a large avenue by the sea that runs from the coast of Arrecife and reaches to Puerto del Carmen. Ideal for lovers of walks. To tour the rest of the island, you can hire excursions or rent a car for specific days. There is a lift in the building. The house is suitable for the elderly and children. If you need a crib or a baby chair you should only request it in advance. There are two fully equipped bathrooms. One has a bathtub with a shower column and the other has a shower with screen. Very homely, clean and modern. Extremely spacious and very home- from- home with everything needed for your stay. Jorge the owner was very courteous and went above and beyond to accommodate our needs and responded very quickly to any questions. Beautiful balcony area with plenty of seating and eating area. Would definitely return in the future and choose apartments instead of hotels for a family stay. A haven in the vibrant city centre. Thank you for a fantastic holiday. What a joy to receive such a great comment. It was a pleasure to serve you during your vacation so that your stay in my apartment was perfect. I recommend everyone who wants to come to Lanzarote to choose the city of Arrecife. It's few places on the island will have the local culture more at hand. Next time do not think about staying in hotels, count on my apartment for your trip. You will be welcome! We had an exceptionally good time at this apartment. The welcome by the owner was very friendly and the information which he gave prior to the visit about the area and the apartment were exceptional. 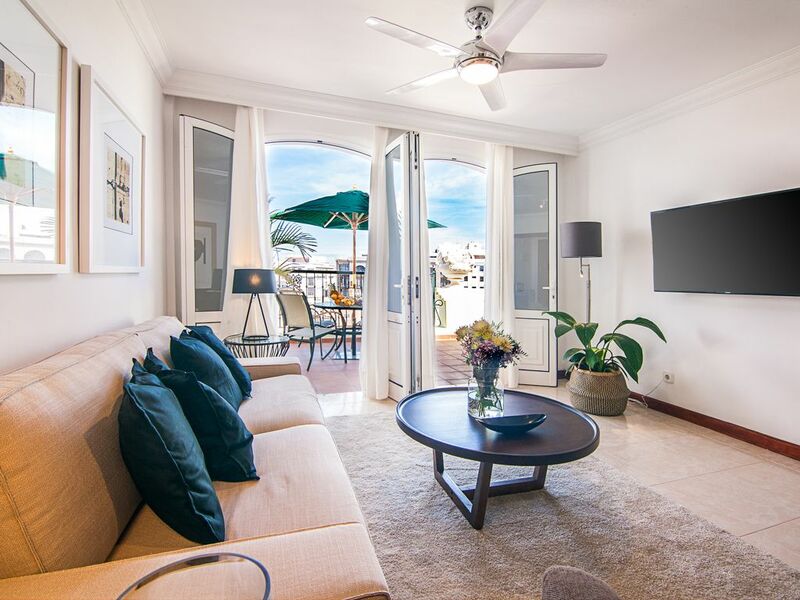 The apartment is situated on the 4th floor of a very secure building in the centre of the town, close to shops, the marina and the beach all being a few minutes walk away. There is an elevator within the building. The actual apartment was exceptionally clean (immaculate when we stayed) and well furnished with everything which you would need for a stay. The only things to bring are your personal toiletries and clothing even such things as washing powder for the automatic washer, shampoo ,soap and shower gel were provided. There was also a bottle of wine, beers and a bottle of water in the fridge! There is a large supermarket in the next block so purchases of food were easy to obtain. There are many restaurants and tapas bars really close and the owner has a list or personally recommended venues. . We would highly recommend this apartment which is competitively priced. Merci beaucoup ! J'apprécie que vous partagiez votre expérience dans mon appartement avec d'autres voyageurs. Je suis heureux que vous ayez apprécié la grande terrasse et que vous aimiez la décoration de l'appartement. Helle geräumige Wohnung mit gut eingerichteter Küche und großem Balkon. Der Strand ist in fünf bis zehn Minuten zu Fuß erreichbar. Die Garage ist eng und nur für kleine Autos geeignet. Sehr gute bewertung! Ich bin froh, dass Ihnen die große Terrasse gefallen hat und wie hell die Wohnung ist. Diese Wohnung ist sehr beliebt, da fast das ganze Haus auf eine 30 Quadratmeter große Terrasse blickt. Deshalb fällt in jede Ecke des Hauses so viel Licht ein. Die möblierte Terrasse ist perfekt für ein Essen im Freien oder für den Nachmittag. Für Gäste, die mit einem großen Auto anreisen möchten, müssen sie lediglich die Reservierungsanfrage kommentieren. Sie erhalten einen kostenlosen Parkplatz im ersten Stock des Parkhauses, der für große Autos geeignet ist. Das Parken im selben Gebäude ist ein großer Vorteil, da das Zentrum schwer zu parken ist. Wie Sie sagen, ist alles sehr nah an der Wohnung, so dass das Auto überflüssig wird. Very good review! I'm glad you liked the large terrace and how bright the apartment is. This apartment is very popular because almost the whole house looks onto a large terrace measuring 30 square meters. That is why so much light enters in every corner of the house. The terrace being furnished is perfect for al fresco dining or spending the afternoon. For guests who want to come with a large car, they only have to comment on the reservation request, so they will be assigned a free parking space on the first floor of the car park which is suitable for large cars. Being able to park in the same building is a great advantage since the center is difficult to park. As you comment everything is very close to the apartment so the car becomes unnecessary. L'appartamento di Jorge è esattamente come appare nelle foto, è molto spazioso, arredato elegantemente e si trova all'interno di un bell'edificio anch'esso rinnovato con gusto. L'ubicazione è buona perchè vicina alla zona pedonale ma in una via carrabile e quindi facilmente raggiungibile con la macchina.Il garage è ottimo.Jorge è un ospite attento, gentilissimo e prodigo di consigli. Grazie a Rosalia per un commento così meraviglioso! È stato un vero piacere averti come ospiti. Sono contento che ti sia piaciuto il mio appartamento. Très bel appartement dans le centre d'Arrecife! Nous avons choisi cet appartement pour notre second séjour a Lanzarote. Et nous n'avons pas été déçus! L'appart est au 4ème et dernier étage d'un immeuble en plein centre-ville, accompagné d'un parking en sous-sol (très pratique car il est difficile de se garer dans cette partie de la ville). L'immeuble est beau, rentrez dans la pharmacie au Rez-de chaussée, vous serez époustouflés! L'appart est nickel et a été récemment rénové. Tout est neuf, je pense que nous avons été les premiers locataires. Grand salon- salle a manger, donnant sur la terrasse, sur laquelle on trouve une table et un salon. 3 chambres avec des lits confortables, de très grands placards encastrés, des coussins partout. La cuisine est bien équipée, manque un lave-vaisselle mais cela est une rareté en location en Espagne. Grand frigo-congélateur, table de cuisson a induction d'une rapidité phénoménale, des placards partout. Il manque un peu de vaisselle pour un peu plus de confort (tasses a cafe, plats et saladiers) pour ceux qui aiment beaucoup cuisiner. La bonne surprise, c'est que le frigo n'est pas vide quand vous arrivez, tout comme les tiroirs de la cuisine: bière, eau, vin, épices sont deja a votre disposition. Les salles de bain sont top, surtout celle avec la douche a l'italienne pour moi, et approvisionnées en gel douche et savon. Dans la buanderie un lave-linge hyper efficace, il y a des produits d'entretien dans le placard et sous l'évier dans la cuisine. Pour les courses, un supermarché Dino est a deux pas dans la rue la plus commerçante de la ville. Pour les restos, le Charco de San Gines est très proche avec de très bonnes tables. Jorge est sympa, soucieux de ses locataires. N'hésitez pas a l'appeler si vous avez un problème. Pour ceux qui veulent une localisation centrale dans l'ile, Arrecife est un des 2 meilleurs spots avec Teguise. En outre, quand vous venez de l'aéroport, c'est très facile a trouver (a l'entree de la ville, au rond-point a gauche sur la Via Medular, puis tourner a droite avant la station Shell et c'est tout droit). Merci beaucoup Philippe pour ton commentaire magnifique et détaillé. Je me sens à la fois soulagé et heureux que mon appartement ait répondu à toutes vos attentes car c'était ma première réservation. Après plusieurs mois à mettre tout mon coeur pour que tout soit préparé, je voulais vraiment recevoir des invités. Avoir toute votre famille dans mon grenier était une expérience agréable dès le premier jour. Je vais prendre en compte vos commentaires sur les ustensiles de cuisine. Je vais améliorer ces aspects afin que mes prochains invités puissent en profiter. Vous êtes invités à revenir quand vous voulez. Ils seront bien reçus! Thank you very much Philippe for your magnificent and detailed comment. I feel at the same time relieved and happy that my apartment fulfilled all your expectations because it was my first reservation. After many months putting all the heart so that everything was prepared I wanted very much to recieve guests. Having your whole family in my attic was a pleasant experience from the first day. I will take into account your comments about the kitchenware. I will improve those aspects so that my next guests can enjoy them. You are invited to return whenever you want. They will be well received! Muchísimas gracias Philippe por tu magnífico y detallado comentario. Me siento al mismo tiempo aliviado y contento de que my apartamento cumpliera todas tus expectativas porque era mi primera reserva. Después de muchos meses poniendo todo el corazón para que todo estuviera preparado tenía muchas ganas de recibir huéspedes. Tener a toda tu familia en mi ático fue una agradable experiencia desde el primer día. Tendré muy en cuenta tus comentarios sobre el menaje de la cocina. Mejoraré esos aspectos para que puedan disfrutarlos mis próximos huéspedes. Están ustedes invitados a volver cuando quieran. ¡Serán bien recibidos! Between its streets and the old town, it is faithfully perceived as a seafaring and commercial city with the endless amount of merchandise arriving from other ports, present in any of its stores and shops. Another trace of its marine connection is the church of San Ginés, patron saint of Arrecife and appreciated in the form of a painting that came from unknown sources across the sea. Arrecife is home to shopping centers, stores, bazaars, small and traditional shops, which house products and articles as varied as they directly refer to the privileged situation of the Canary Islands as a step and encounter between continents. The different fiscal treatment of the islands offers more competitive prices in a large part of commercial products. Arrecife also has the Reducto Beach, blue flag of the European Union, its long avenue that borders the marine coastline and a charming and appealing corner as is the Charco de San Ginés, located next to the church of San Ginés. It is a kind of lake formed by the entrance of sea water, rest of barges and small boats, surrounded by small fishermen's houses, where the good work of the local artist César Manrique has also intervened. Marina Lanzarote is a modern sports marina located in the heart of the island that has a wide range of leisure and catering. The climate in the Canary Islands is influenced by the trade winds. The same winds that pushed Columbus to his adventure through the Americas. Here we enjoy a mild winter and summer. With very pleasant temperatures and many days of sunshine. Canarias is made to enjoy the outdoors. Si necesitas plaza de aparcamiento avise al reservar. Si necesita cuna o sillas para bebé avise al reservar. No se permiten fumar. No se permiten fiestas. No se permiten animales.